Generation Mars | Kid Reporters' Notebook | Scholastic Inc.
Astronaut Buzz Aldrin, a member of the Apollo 11 mission, walks on the Moon on July 20, 1969. Fellow astronaut Neil Armstrong was the first to set foot on the planet. When Buzz Aldrin was growing up in the 1930s in New Jersey, he wanted to be a football player for the University of Notre Dame. Astronauts were still the stuff of science fiction. In 1963, having graduated third in his class from the United States Military Academy at West Point, Aldrin earned a doctorate from the Massachusetts Institute of Technology. Soon, he was selected as an astronaut for NASA (the National Aeronautics and Space Administration). Earlier this month, I spoke with Aldrin at the National Book Festival in Washington, D.C. He was there to talk about his new children’s book, Welcome to Mars: Making a Home on the Red Planet. At age 85, the former astronaut believes that sometime in the future, people will live on Mars permanently. Aldrin is accustomed to being far from home. On July 16, 1969, he and two fellow NASA astronauts, Neil Armstrong and Michael Collins, climbed into a rocket and blasted off from the Kennedy Space Center in Florida. Many people, including Aldrin, wondered if the astronauts would make it all the way to their destination: the Moon. “We’d had missions scrubbed, postponed at the last second,” Aldrin said. "Probably the most dangerous part that crewmen or pilots think of is the first liftoff of that rocket." As the Apollo 11 mission began its ascent into the sky, a NASA official said, "We have lift-off!" Those words echoed around the world, as millions of people watched on black-and-white television sets. 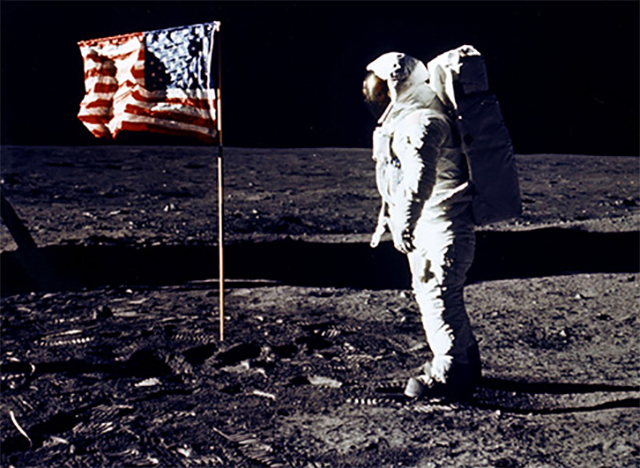 Days later, Armstrong stepped onto the Moon. "That’s one small step for man, one giant leap for mankind," he said. Aldrin followed soon thereafter. I asked Aldrin what it was like to stand on the Moon and look back. "We had already seen the Earth grow smaller and smaller through the window through a telescope,” he said. "As one astronaut said, 'I could hold up my thumb and cover the whole Earth.'" The lunar mission fulfilled a dream of President John F. Kennedy, who had been assassinated in 1963. "It is time," Kennedy told the U.S. Congress in 1961, "for this nation to take a clearly leading role in space achievement, which in many ways may hold the key to our future on Earth." With his new book, Aldrin hopes to inspire kids to prepare for an unusual life—setting off for Mars with no expectation of returning. Aldrin says that such a mission will take years of preparation. Making the planet habitable will be yet another hurdle. Growing a garden might be possible at first, Aldrin says. But milking cows? "I don’t think so." The rewards, however, will be worth it. Permanent settlers on Mars, Aldrin believes, will "improve things for the next people who come." Would you like to be a space pioneer? Why or why not? Watch a clip from Gabriel’s interview with Aldrin.